no. These were winter squash and their journey to the table has just begun. There are many varieties of winter squash as you can see above, one a deep green, one a buttery yellow, yet they all require a long curing period before they are ready to be eaten. 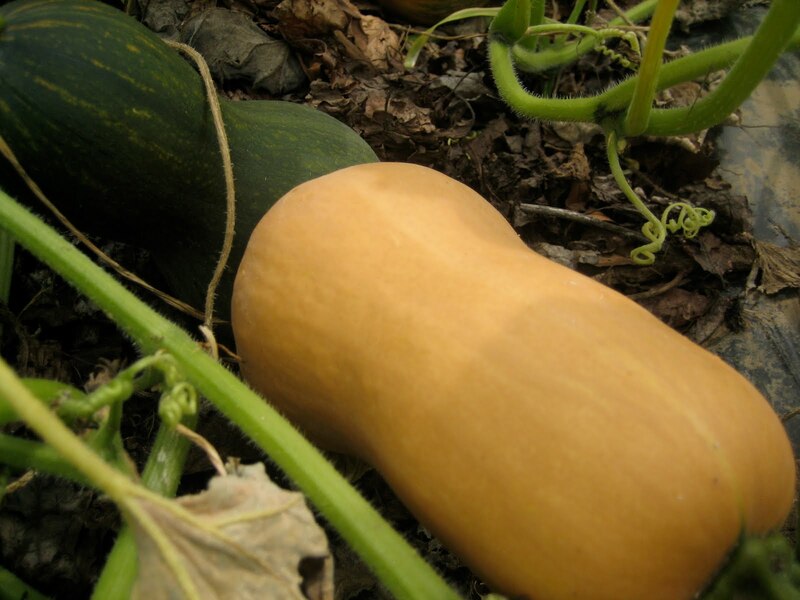 Over the next few months, the squash will stay in the field untouched while their rinds harden. The summer squash, like this snake-looking fruit around my neck, is really tasty and can be eaten whole, skin and all. You can grill it for a few minutes on each side and you're ready to go. On the other hand, the curing process will turn the rind of the winter squash into a nice, hard, inedbile protective casing, which must be removed before consuming. One great way to eat the winter varieties is to cut them in half and bake them with a little butter and maple syrup. The seeds are great toasted as well. We'll have an update as the rinds begin to cure. They will be harvested probably some time in November if all goes well. Until then, enjoy the last days of summer squash!